Water-colour drawing of a view of the Fort at Agra from the river, after William Hodges, by a Calcutta artist, dated 1800-1810. This view of Agra Fort is after the engraving by J. Walker 'A View of Agra taken from the South West. ... from a Picture painted by W. Hodges R.A. in the Collection of Warren Hastings Esq.' published in William Hodges's 'Travels in India During the Years 1780 ... 1783' (London, 1793). 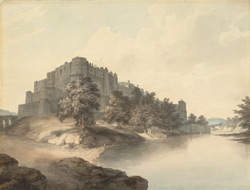 The drawing like the engraving is taken from where the outer moat of the fort met the river and in Hodges's usual picturesque manner greatly exaggerates the height of the walls, making it resemble Gwalior rather than Agra. The style is almost entirely in the English manner. Agra was one of the principal cities of the Mughal Empire. The Emperor Akbar (r. 1556-1605) resided here at the beginning of his reign and completed this fort in 1573. It dominates the centre of the city and lies on the right bank of the river Jumna. Later additions were made to the fort by Akbar's successors, the emperors Jahangir and Shah Jahan.